What does a greenhouse technician do? Would you make a good greenhouse technician? Take our career test to find out how you match with this and over 800 other careers. What is a Greenhouse Technician? What is the workplace of a Greenhouse Technician like? A greenhouse technician works in a greenhouse, typically a glass or plastic structure that regulates temperature and humidity for the purpose of cultivating plants. A greenhouse technician is in charge of transplanting, thinning, harvesting, drying plants, and treating and watering seeds. They are often in charge of managing seed storage, such as labelling and categorizing seed envelopes with instructions for growth. 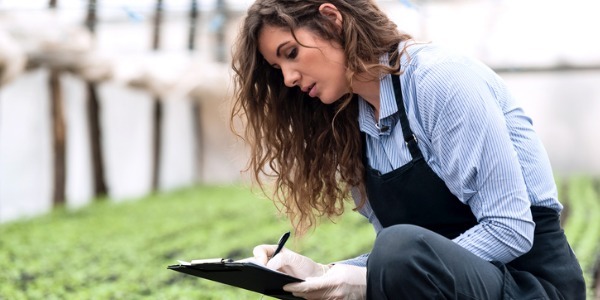 Greenhouse technicians collect data by keeping records of plant growth statistics and making environmental and care decisions based on that data. As well as dealing with the planting and harvesting in a greenhouse, a greenhouse technician also deals with the science behind growing crops. Greenhouse farming can be more flexible than regular farming because crops grown this way are rarely susceptible to disease, pests, and harsh climates. This type of farming is also ideal for growing crops in areas that wouldn’t otherwise have ideal growing conditions. Since greenhouses have complete environmental control to maximize the growing potential of crops, greenhouse technicians can experiment and implement processes that will maximize crop output. A greenhouse technician takes samples from plants and records data to learn more about how a specific environment is affecting a plant. They can then use that data to optimize the growing environment which might include temperature, water, light, humidity, and nutrients. This helps to develop new ways to care for crops, increase hardiness, and improve yields. Farming in a greenhouse introduces a whole new set of expenses related to the building and maintenance that doesn’t happen with outdoor farming. Each greenhouse is managed differently to cut costs and maximize the growth of crops. For example, greenhouses are able to take advantage of vertical space, which means farmers are able to pack more plants into a greenhouse than usual. Are you suited to be a greenhouse technician? Greenhouse technicians have distinct personalities. They tend to be investigative individuals, which means they’re intellectual, introspective, and inquisitive. They are curious, methodical, rational, analytical, and logical. Some of them are also realistic, meaning they’re independent, stable, persistent, genuine, practical, and thrifty. Does this sound like you? Take our free career test to find out if becoming a greenhouse technician is right for you. Greenhouse technicians typically spend most of their time in the greenhouse. There is some physical labor involved, like planting, pruning, and harvesting the plants. Depending on the size of the greenhouse, there may be a lot of plants to attend to. Technicians also spend some of their time at a computer, inputing data that they have collected.